MFA Oil Foundation Awards Grant | F.F.A.M. The MFA Oil Foundation has awarded a grant to the Firefighters’ Historical Preservation Foundation to assist with purchasing display cases. The MFA Oil Foundation provides support to nonprofit organizations that are working to improve communities where MFA Oil has a significant concentration of members and employees. Since it was established in 1998, the MFA Oil Foundation has awarded more than one million dollars in grants. 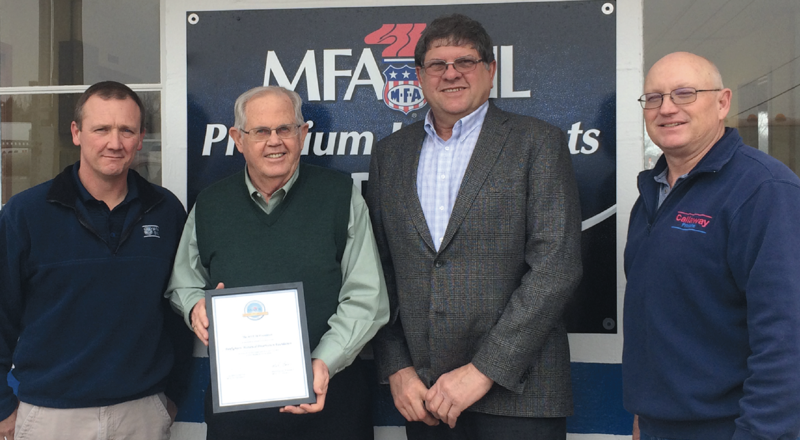 MFA Oil Company, formed in 1929, is a farmer-owned cooperative with more than 40,000 members. MFA Oil is one of the top ten propane companies in the United States. The company supplies fuels, lubricants and propane to customers in Missouri, Arkansas, Oklahoma, Kansas, Indiana, Kentucky, lowa, Colorado, Nebraska, North Carolina, Wyoming, Tennessee, Georgia, and Utah. Through a subsidiary, MFA Oil operates Break Time convenience stores in Missouri and Arkansas, Jiffy Lube franchises in central Missouri and Big O Tires franchises in central Missouri and Arkansas.